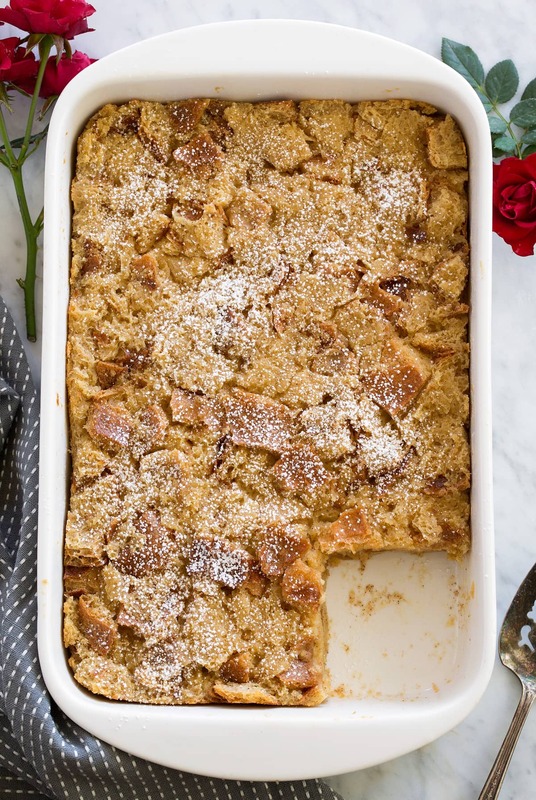 Who can resist warm from the oven homemade Bread Pudding? Here you get fresh bread soaked in a rich, spiced custard, then it’s gently baked until set and served with a homemade caramel sauce and fluffy whipped cream. So delicious! 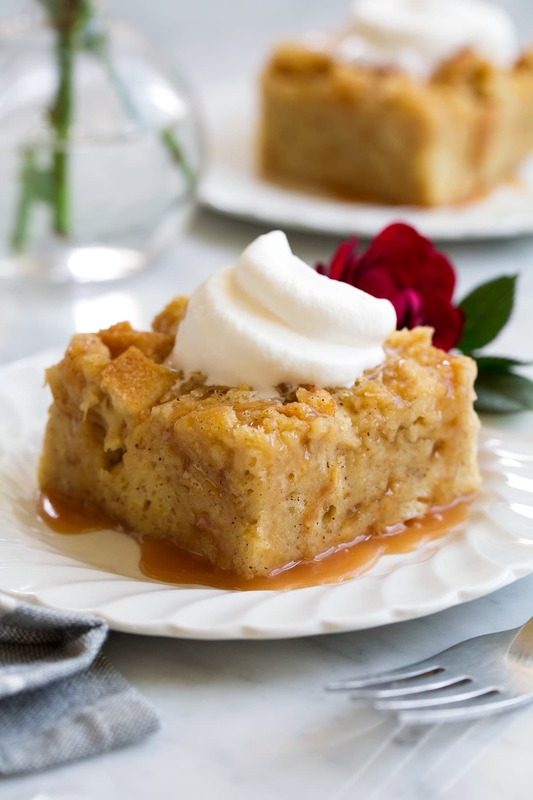 This homestyle Bread Pudding recipe uses simple ingredients yet you get such a tasty end result. It’s one of those back to basics recipes that people just love. 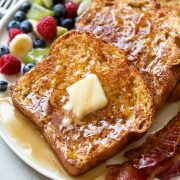 It’s deliciously creamy and perfectly sweetened and spiced. And when you finish it with caramel sauce no one will be able to resist! Spread the bread cubes evenly onto a baking sheet then bake until nearly dry, tossing once halfway through, about 10 minutes. Set aside. 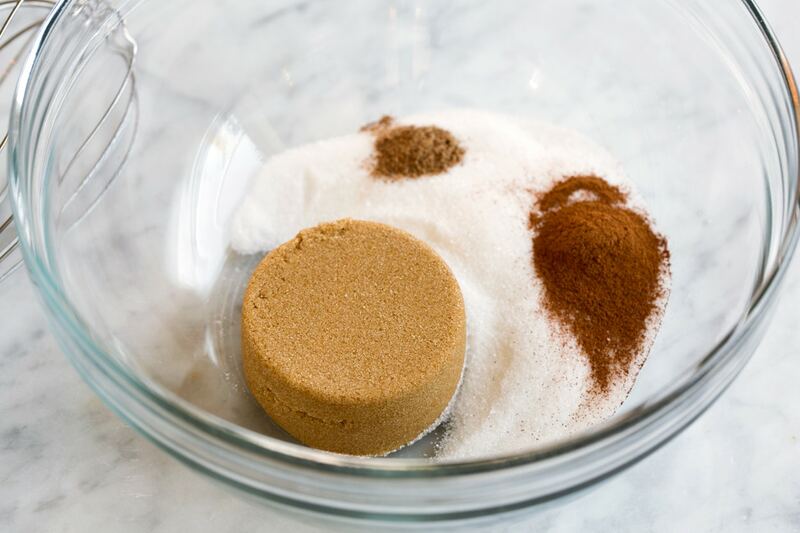 In a large mixing bowl whisk together brown sugar, granulated sugar, cinnamon and nutmeg. Add eggs and egg yolks sand mix until well blended. 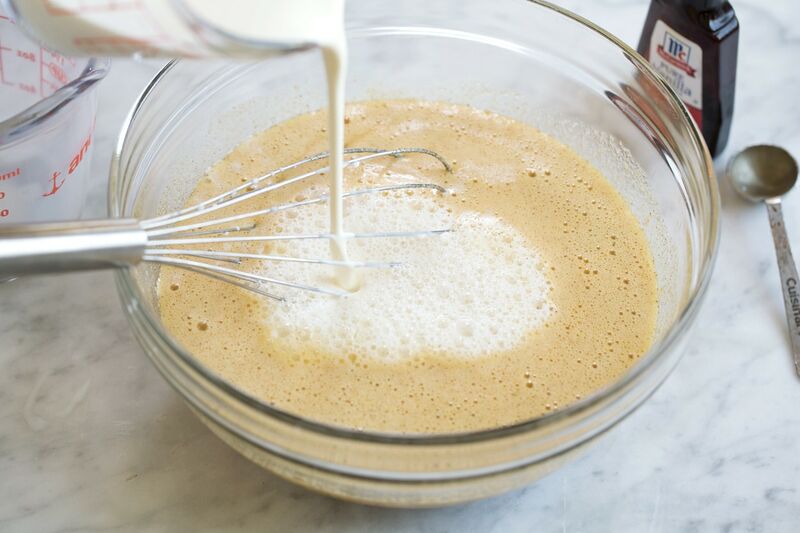 Pour in milk, heavy cream and vanilla and whisk until well combined. Place bread cubes in an extra large mixing bowl. Pour milk mixture over top then toss with a rubber spatula to evenly coat. Let rest 15 minutes to absorb mixture, tossing occasionally. Spread melted butter in baking dish then add soaked bread mixture. Spread into an even layer. Bake until set in center, about 50 – 65 minutes. Let cool 10 minutes then serve warm with desired sauce and optional whipped cream. What Sauce Should I Serve with This? 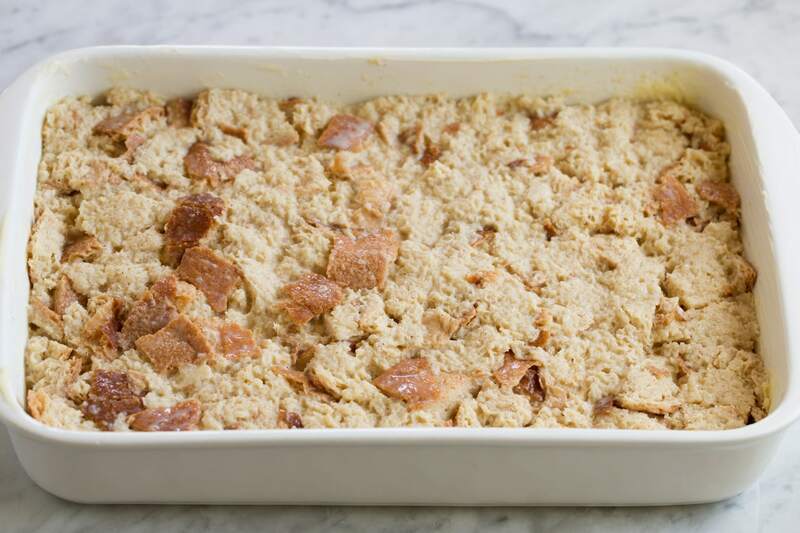 Can I Make Bread Pudding in Advance? 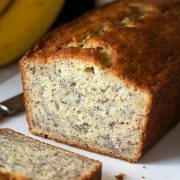 You could prepare this the day before then chill and bake the next day. Let it rest at room temperature while oven preheats, then add extra time to baking as needed. Of course raisins can be added to this recipe if you’d prefer. Add up to 1 cup, just rehydrate them first. To do so soak in boiling water for 30 minutes then drain. 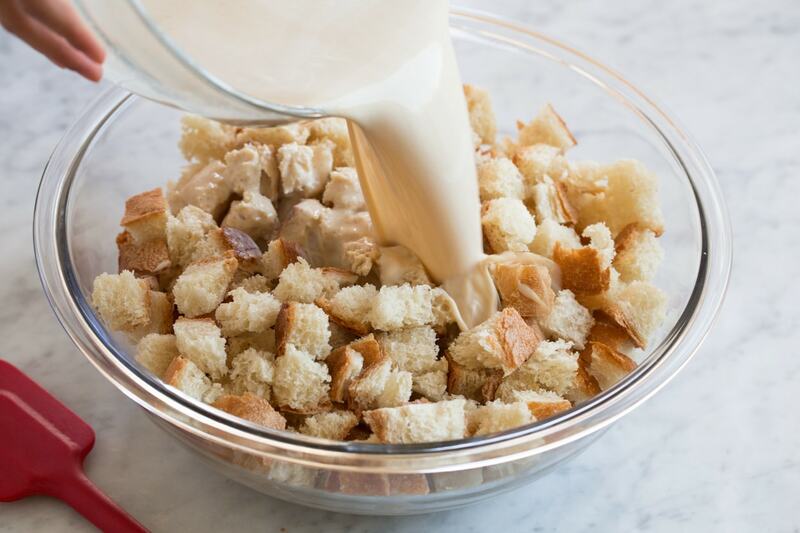 Toss in with the bread cubes then pour in milk mixture. Here you get fresh bread soaked in a rich, spiced custard, then it's gently baked until set and served warm. 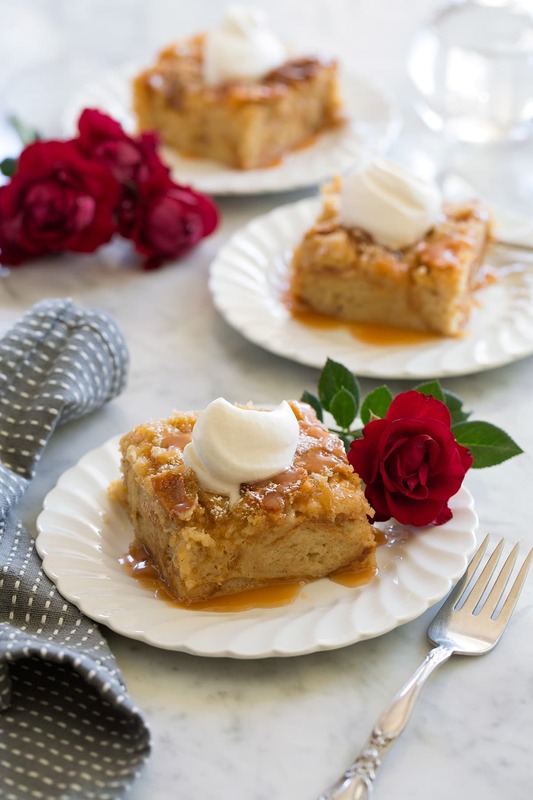 Top with homemade caramel sauce and fluffy whipped cream for extra decadence. 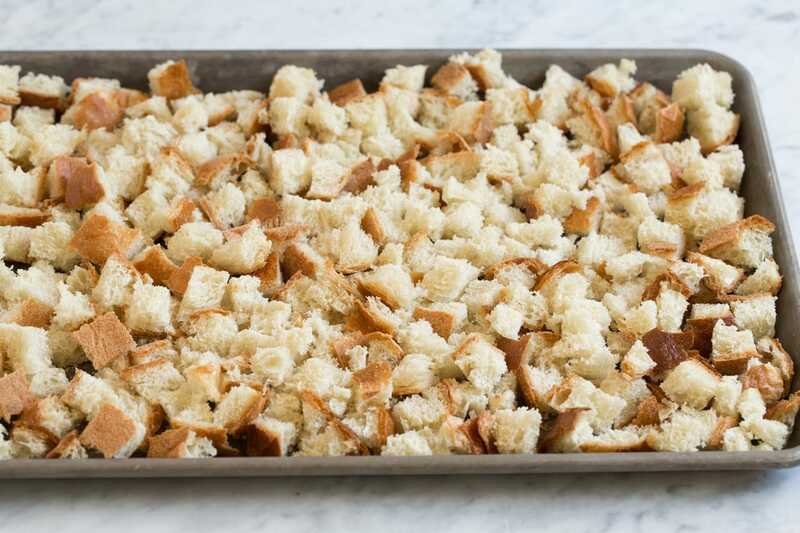 Spread bread cubes evenly onto a rimmed 18 by 13-inch baking sheet then bake in preheated oven until until nearly dried, tossing once halfway through, about 10 minutes total. Remove and let cool. 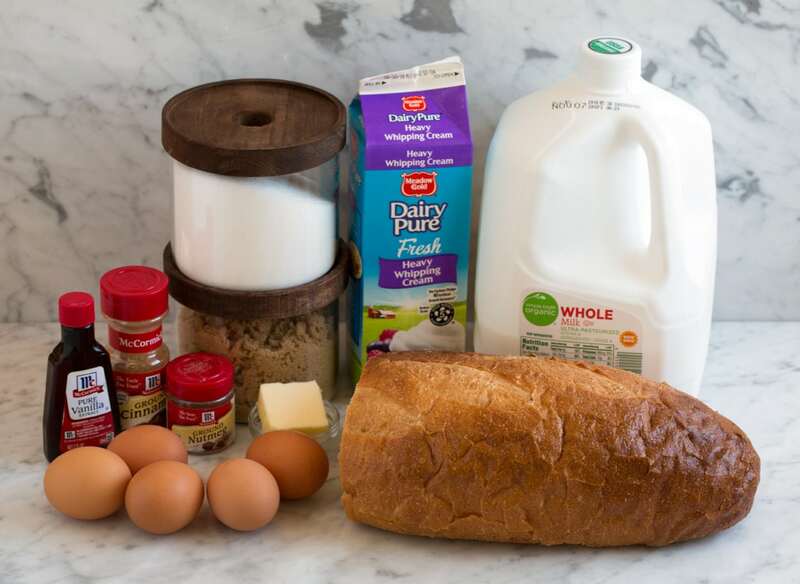 In a large mixing bowl whisk together brown sugar, granulated sugar, cinnamon and nutmeg (while breaking up brown sugar clumps with fingertips as needed). 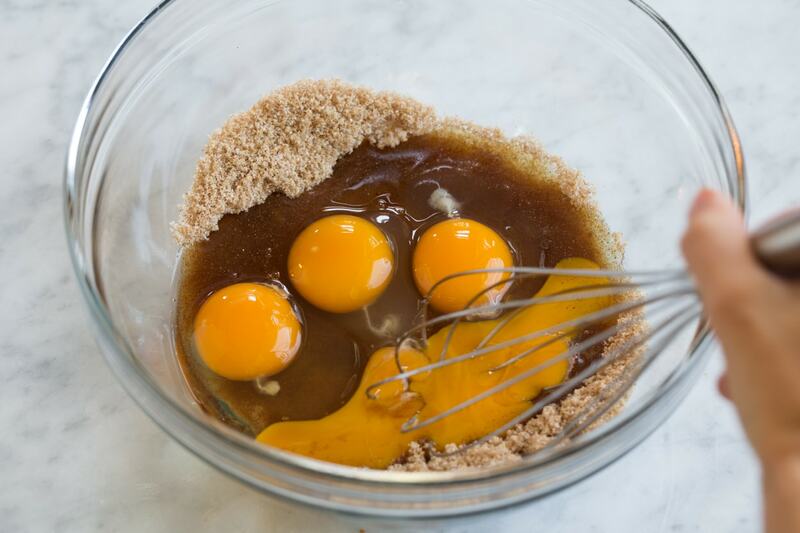 Whisk in eggs and egg yolks until combined. Then blend in milk, heavy cream and vanilla extract until well combined. Place bread cubes into an extra large mixing bowl, pour milk mixture over top then toss mixture with a rubber spatula to coat. Let rest until milk mixture has been absorbed, tossing occasionally, about 15 - 30 minutes. Spread melted butter into a casserole dish (about 12 by 8-inch). Pour bread mixture into baking dish and spread evenly. Bake in preheated 300 degree oven until center is set, about 50 - 65 minutes. 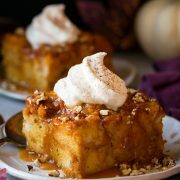 Let cool 10 minutes then cut into squares and serve with salted caramel sauce or vanilla sauce and whipped cream if desired. Follow link HERE for Salted Caramel Sauce. Nutrition does not include toppings.